A train has derailed at a Long Island Rail Road (LIRR) train station in Brooklyn, New York reportedly injuring at least 100 people and damaging the station. Video from Atlantic Terminal shows the train having crashed into a door on the platform after coming off the line. The window is smashed and the structure twisted from the impact. Early reports said 20 people received minor injuries in the crash, however the FDNY tweeted that there were “103 injuries reported at scene of Atlantic Terminal LIRR train derailment, all non-life-threatening.” People were seen being taken from the station on stretchers. The train derailed from track six after hitting a bumper block upon its arrival at the station. The station quickly filled with smoke, officials told the NY Post. It had departed from Far Rockaway at 7:18am and arrived at Atlantic Station at 8:20am, nine minutes behind schedule. “We were standing and waiting to get off. 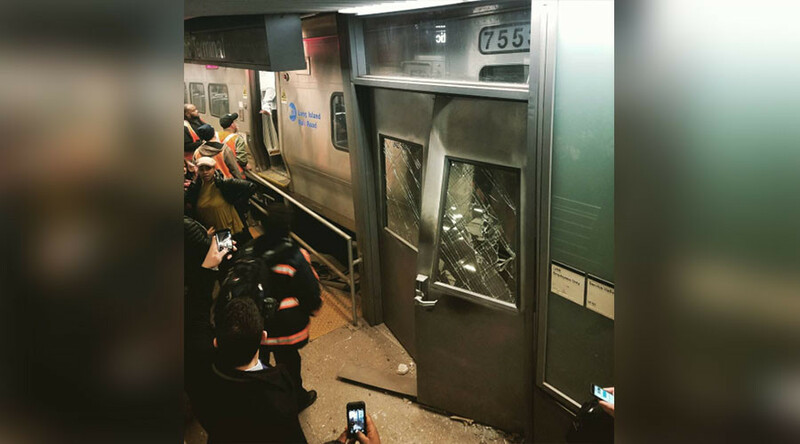 One of the doors shattered and we all fell on top of each other,” one passenger told the NY Post. “The train hit the end and came off the tracks. There was a screeching and the station quickly filled with dust and smoke,” another eyewitness said. Images taken from inside the train show collapsed seats and debris. Video from the terminal shows rescue services at the scene. Governor of New York Andrew Cuomo inspected the scene of the crash. He described it as “minor compared to Hoboken,” in reference to the crash in September last year at a New Jersey station that left one person dead and over 100 injured. “The most serious injury was a broken leg,” he tweeted regarding Wednesday’s derailment. LIRR have advised commuters that there will be a delay to services.